SMSReader - How to Solder - Development - SMS Power! If you've never attempted any electronic construction before, you'll probably want to know about the basics of soldering. Soldering is a skill which seems hard to pick up at first, but once you've had some practice, you'll master it in no time. Solder is a soft alloy of lead and tin, with a melting point of around 180 degrees Celsius. For the purposes of electronic construction, it comes in the form of rosin-cored 60/40 solder wire. The rosin serves as a flux which removes the oxide film from the metal to be soldered. Soldering is the act of making a joint between two metals, by heating up the junction between the metals (using a soldering iron) and applying solder to it. The solder will melt and bond to the metals, and will then cool and harden when the soldering iron is removed, forming a physically and electrically stable joint. 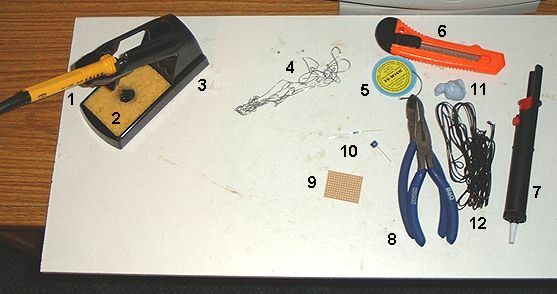 The typical, inexpensive soldering iron used for electronic construction has a power rating of between 17 and 25 watts, and is powered from the mains. The bit of the soldering iron is the part which comes into contact with the metal and solder - the bit should be removable. It's best to choose a soldering iron with a range of available bits, so you can choose the appropriate size for the task in hand. Generally a bit of between 0.5mm and 3mm should be used for soldering electronic components to Veroboard - 1mm is the optimal size, in my opinion. When plugged in, the iron will take between 1 and 2 minutes to heat up fully. The first time you use a bit, you should apply a small amount of solder to it, known as tinning the bit. This serves a protective function and improves heat conduction, allowing joints to be made more quickly. You will need to re-tin the bit from time to time. You should buy a soldering stand, for reasons of safety and convenience. The stand keeps the bit away from anything it could set alight or cause damage to, and also provides a handy place to keep your sponge and spare bits. Good iron maintenance is important. The bit should be taken off periodically, and any black metal oxide removed with a dry cloth, from both the bit and the iron's shaft. Soldering iron bits should not be filed or sanded - this will remove their protective coating, and they will not last very long. I'm left-handed, by the way, in case you were wondering. Note the white chipboard used to protect the desk surface from scorches and solder splashes. 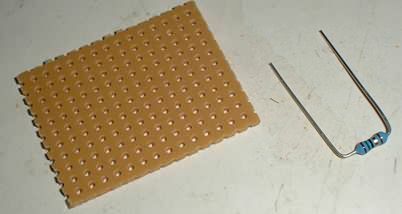 Bend the component's legs to the correct shape to fit the Veroboard holes you're going to solder into. Use pliers for this, or just use your fingers. Insert the legs through the board, so they protrude on the track side. 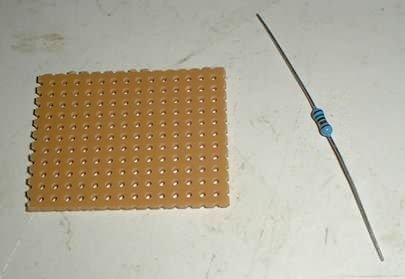 Get the component as close to the board surface as you can, then bend the legs outward slightly to secure it in place. 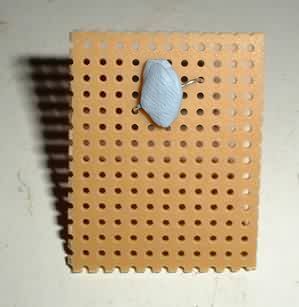 You can add a blob of Blu-Tack to anchor the component while you're soldering. With the track side of the board upwards, place the bit of the iron so it contacts both the component leg and the track of the board next to the hole. Apply light pressure. 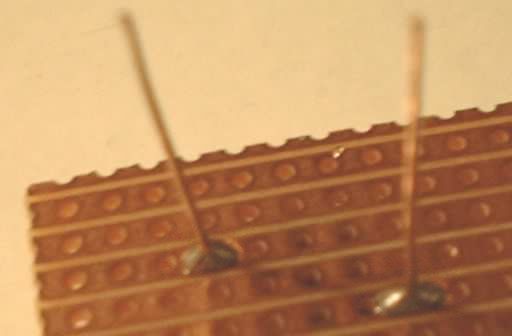 After a second or two begin feeding solder into the junction between iron, leg and track, where it will begin to melt and run around the hole. Remove the solder and the iron simultaneously. If all went well, you should have a good joint! The surface of the solder should be even and shiny. The joint should be symmetrical, with an approximately even distribution of solder around the hole. Most importantly, the solder should not have crossed the gaps between the tracks, which would create a short circuit. You will soon get a feel for how much or how little solder to apply. Here are some examples of joints (good and bad) and common mistakes. 1 and 2 are reasonably good joints. 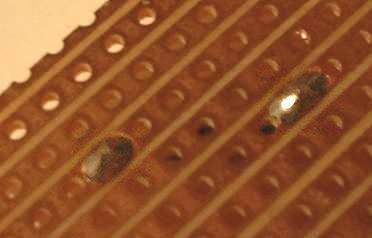 The surfaces are even; there is enough solder to ensure a stable joint but not so much that it overruns adjacent holes and tracks. 3 has too much solder applied to it. 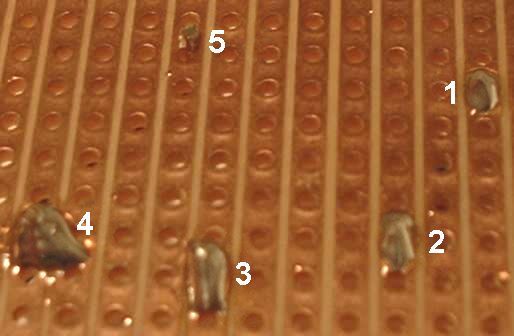 The solder is "heaped up" and has run into adjacent holes, which could cause problems when soldering leads into these holes. 4 is very bad news. So much solder has been applied to the joint that it has flowed between tracks, causing a short circuit. It will have to be cleaned up using a desolder pump or desolder braid. 5 is also a bad joint. Not only is there not enough solder present, but the joint is dry - that is, it was not heated up enough or the solder was disturbed while cooling. Dry joints are not electrically or mechanically stable - the solder will break away from the track very easily, and the joint will not conduct electricity very well or will do so intermittently. A dry joint has a dull, cracked and/or uneven appearance.